What is included in the welcome hamper? Medley Court is a self-catering property however a welcome hamper is provided to get you started. This hamper includes a jar of marmalade, a jar of jam, cheese, four pints of milk, butter, tea bags sugar, a couple of coffee sachets for the Cafetiere, bread (one x white bloomer, one x granary bloomer) muesli and a selection of cereal, six eggs, fruit, orange juice, a bottle of wine and a Castle kitchen baked treat. How do I find Medley Court? Please arrive to the private gated entrance of the Astor Wing which is 100 yards down the road from the main arched entrance to Hever Castle. There is a small white sign on the roadside for ‘Stables House’ and the private gated entrance is opposite this sign. Select ‘Astor Wing’ on the intercom and the gates will be opened for you. Please park in the private car park at the bottom of the drive and go to the Astor Wing Reception upon arrival. Check in time is from 4pm however with advance notice guests can arrive from midday on their day of arrival to collect their complimentary tickets to the castle and grounds from the Astor Wing reception, spend time in the grounds and return to check in from 4pm. What time must I leave? Check out is by 10:30am. We ask that you advise the Astor Wing reception when you leave. Is access to the castle and gardens included in my stay? Yes, entrance to the Castle and Gardens is included in your stay throughout the duration of your stay for resident’s names on the Booking Sheet. If you wish to stay on in the grounds after you have checked out on your day of departure you are welcome to, however, we ask that you move your car to the Day Visitor car park after you have checked out at 10:30am. Can I organise for a supermarket delivery? Yes, but please notify us of any such delivery and please do not book a delivery time before you are due to arrive or for a time when you are not going to be in to receive it. We cannot take responsibility for any orders that are made for a time when you are not in residence. There is ample parking for at least 4 cars on the Medley Court drive in front of the house. Is there a working fireplace? Yes there is one working fireplace in the lounge. Wood, kindling and matches are provided and replenished as required. How many people does Medley Court sleep? Medley Court sleeps up to eight guests. The bedrooms consist of two double en-suite bedrooms on the ground floor and a further two bedrooms (one double and one small twin) ) on the first floor that share a bathroom. The double on the first floor can be a made into a twin bedroom (two single beds) if preferred. Our insurance policy does not cover for more than this number of overnight guests so please respect this maximum. Yes, children are welcome but must be included in the maximum number of eight residents. We can, when required accommodate an additional child on a z bed in one of the ground floor double bedrooms. Can non-residents join us during our stay? As Medley Court is located on a private estate, visitors other than the guests named on the booking form are not permitted access to The Astor Wing entrance or Medley Court. You are welcome to arrange to meet your friends and family within the gardens and ground of Hever Castle but they will need to arrive as Day Visitors and as such purchase tickets at the ticket hut. I only want to stay for two nights – when can we book short stays? Short stays are available on a short lead basis, bookable on any available dates within eight weeks of any date in time. A minimum of two nights must be booked. 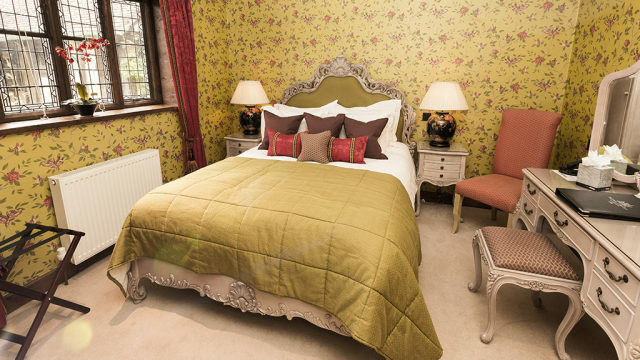 If you require only one night we suggest you check the availability of our luxury Bed and Breakfast. What facilities do you have in the kitchen? There is a double oven with hob, a fridge freezer, a wine cooler, a dish washer, microwave and washer / dryer machine. Yes and towels and bed linen are changed once during a week’s stay. This service can be provided more frequently on request if required, at a charge that is payable on departure. Hever Castle itself offers such a huge variety of activities within the grounds of the estate during opening times, including beautiful formal lawns and gardens to be explored, a 38-acre lake to walk around and a boating lake with rowing boats available to hire seasonally. There is an adventure playground, a yew maze and a water maze. Further afield other attractions within the local area include Chartwell, the country home of Winston Churchill, Penshurst Place, Pooh Corner, Groombridge Place & Wakehurst Place. How far are the nearest restaurants/pubs? On days when the estate is open to the public, there is a café in the grounds serving a selection of hot and cold food, sandwiches and snacks during the day. There is also a traditional English public house opposite the entrance to the castle called the Henry VIII Inn offering lunches and evening meals (it is advisable to book in advance to guarantee a table). A list of locally recommended places eat is provided in your welcome information folder in Medley Court. For a full Access Statement for Medley Court, please click here. Is there an outside terrace? There is an outside covered seating area with beautiful views across the Astor Wing lawns and to the castle and private garden. Given the nature and age of our beautiful castle, BBQ’s are not permitted. What are the payment terms and cancellation policy? A non-refundable deposit to the value of one third of the total rental cost of your booking is requested at the time of booking unless your booking is within eight weeks of your arrival date when the full rental charge will be payable. The remaining balance is due at least eight weeks prior to your arrival date. If you cancel your booking within eight weeks of the arrival date, 100% of the rental charge will be payable. A damage deposit of £250.00 is taken when you check in and will be refunded within one week of your departure subject to the property and its contents being returned to us in its original condition. Any damage costs will be taken from the damage deposit. Can I arrange for a private chef for a lunch or a dinner during my stay? Yes, with advance notice and subject to the availability of a chef given other events that may be taking place on the Estate. More details are available from the Astor Wing Sales Office on 01732 861 800.